In this Part we will explore the meaning of the 2nd Shloka of Sri Vishnu Sahasranamam. The Lord is pure and is untainted by the actions of the body (Jivatma) in which he resides; He is the Ultimate Consciousness Who is the Knower, Seer, Sustainer, Enjoyer and those immersed in his thoughts attain Paramagati or Moksha, and enjoy the eternal bliss that is limitless. Pootatma is the pure or untainted Atman or Soul. ‘Poota Atma yasya sah Pootatma – The One who’s Atman is absolutely Pure’. The JivAtmas have the Vaasanas (desire or impressions from the past) or the associations coming from the fruits of actions from the past that the Jivas are involved in because of the doer-ship associated with their bodies. Even though Bhagavan is also associated with the same bodies since we are all extensions of His body, He is Pure Atman because He is not affected by the fruits of action associated with the bodies. He is, therefore, in essence free of Gunas and Vaasanas. 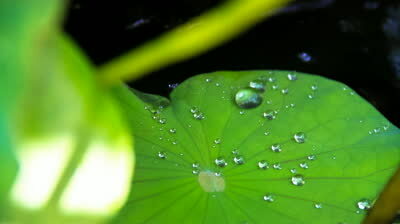 Just like the water droplets on a Lotus leaf never gets attached to the leaf, Bhagavan too remains untainted despite being associated with the actions of the bodies in which He is present. Meaning: There is no work that affects Me; nor do I aspire for the fruits of action. One who understands this truth about Me also does not become entangled in the fruitive reactions of work. Meaning: O’Dhananjaya (Arjuna), these Universal activities never bind Me. I am situated neutrally and unattached to all these activities. Svetashvatara Upanishad (6.11) says He is ‘Kevalo Nirgunashcha – He is Pure and Unsullied by Gunas’. Paramatma means the Supreme or the Ultimate Soul for which there is none superior. This word can be interpreted as ‘Paramah chaasau Atma cha Paramatma’ or ‘Paro Ma Asya sa Aatmaa Paramatma’. Meaning: Within the body, Supreme to the individual consciousness, an in-dwelling observer, sanctioner, preserver, enjoyer and indeed the ultimate controller as well is described as the Ultimate Consciousness. He being a witness, is ‘Updrashta’ and of uniform wisdom is ‘Unmantha’ and being responsible for maintaining all is ‘Bhoktha’, and being the creator is ‘Maheshvarah’. The ‘Cha’ after Paramatma is the conjunction that seamlessly joins the concepts of Pootatma and Paramatma. This Nama means that One who is the ultimate goal for all Muktas or Released or Liberated Souls. Meaning: At the end of many births, the one who has gained the knowledge that ‘Vasudeva is everything’, reaches me. Such a wise person is very rare. Maam Upetya tu Kaunteya Punarjanma na Vidyate meaning Anyone who resorts to me will be released from the cycle of repeated births and deaths. Meaning: Param means Ultimate and Gati means destination or goal; hence Paramagati is the goal after attaining which you will not desire anything else. Normally, the nature of any goal is such that once you attain that goal, then you will want to set the next higher goal. This is not the case with ParamaGati as this is the ultimate goal and the final target. The basic meaning is one who has no ‘Vyaya’, that is one who does not experience any kind of change or decay or deterioration. Brihadaaranyaka Upanishad (4.4.25) says of Bhagavan ‘Ajaro Amaro Avyayayah – For Him there is no old age or decay or any change’. In Gita Chapter 7 Verse 25 Lord Krishna says ‘Moodhoyam Naabhijaanaati Loko Maam ajam avyayam meaning – The ignorant person does not realise Me as unborn and unchanging’. 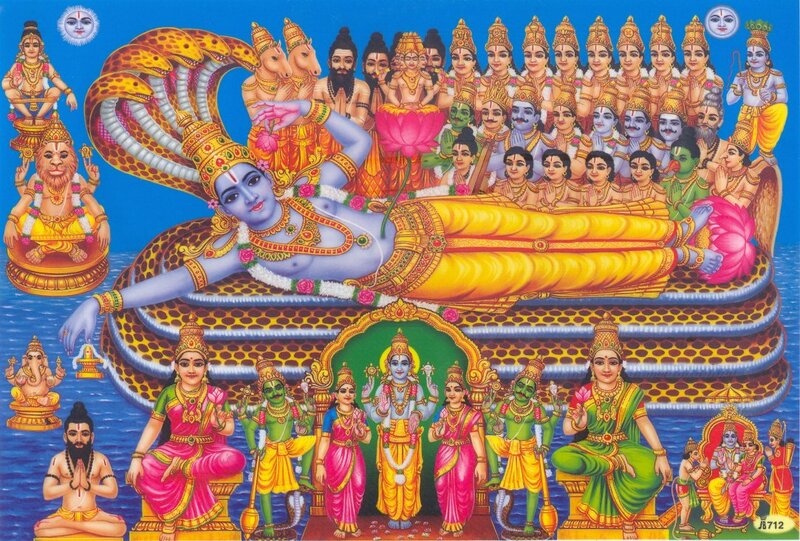 Narayana Suktam says of Bhagavaan ‘Anantam avyayam Kavim – the immortal and indestructible Seer’. This Nama can be interpreted in many different ways. Puru sanoti iti purushah – Gives plentifully to His devotees. Puru means in ample measure and sanoti means bestows. Pura Aaseet iti Purushah – He was there before anything existed. Taitriya Samhita (1.23) says ‘Poorvameva aham iha aasam iti tat purushasya purushatvam – I have been here since time immemorial hence I am called Purushah’. Purayati iti Purushah – One who completes and gives fulfilment to existence everywhere. Swami ChinmayAnanda suggests that these different ways of interpreting the meanings of this Nama is a way to understand more and more about the true nature of the Lord. He perceives everything directly without the need for any medium or intermediaries. Sri Adi Sankara says ‘Saakshaat avyavadhaanena svaroopabodhena eekshate pashyati sarvam iti Saakshee – The All-Knower, the Omniscient Bhagavan sees everything directly by His own awareness without any instrument for seeing (such as the sense organs)’. Sri Parasara Bhattar interprets this Nama as indicating that the Lord witnesses the muktas or the liberated souls enjoying the Bliss that He confers on them, and is thus happy Himself. Meaning: O’Kounteya (Arjuna), the material body is known as the field of activity. Those who know this describe this as knowers’ of the field of activity. So Kshetragnah is one who understands the Kshetra namely ‘Kshetram jaanaati iti Kshetragnah’. In other words Kshetragnah is the Purusha who resides in the Kshetra and knows everything about it. Krishna specifically says ‘Kshetram chaapi maam viddhi – Know myself as the Knower of the Field’. Sri Parasara Bhattar’s interpretation of this Nama is ‘One who knows, and can lead the muktas to the exact place where the muktas will get their sought-after Supreme Bliss.’ So kshetra in his viewpoint is the exact location of Supreme Bliss. Sri Adi Sankara’s interpretation is: “sa eva na ksharati iti aksharah – He alone exists without dying”. The purport of this is that it signifies the Paramatman as against Kshetragnah which denotes the JivAtman. Also according to him ‘Eva Cha’ are significant conjunctions connecting Kshetragnah and Aksharah. The ‘Eva’ denotes that the two are identical in principle. The ‘Cha’ denotes that there are however some apparent differences between Kshetragnah (the Jeevaatmaa) and Aksharah (the Paramatma). Aksarah also means to enjoy. He gives unlimited bliss to those who are immersed in his thoughts and such a joy is limitless. The Lord is pure and is untainted by the actions of the body (Jivatma) in which he resides, so He is Pootatma. He is the Ultimate Consciousness who is the Knower, Seer, Sustainer, Enjoyer and the Paramatma. Those immersed in his thoughts attain Paramagati or Moksha, so He is MuktanamParamagatihi. He is immortal, indestructible and has no decay, hence He is Avyayah. Our body is considered an abode and He resides there and hence He is Purushah. Bhagavan is Omniscient and sees everything as a Sakshee. He is Kshetragnah as He leads his devotees to Supreme bliss. He is without destruction and eternal, so He is Aksharah. I have been chanting sahasranamam since childhood however after going through the meaning and interpretation from various sages like Adi Shankara , Parasara Bhattar , Chinmayananda etc, my appreciation of this holy text in relation to other Vedic hymns like Purushah sooktham , Narayana Sooktham and Bhaagavadham my spiritual interest and inspiration to learn is increasing day by day . With Lord Narayana’s grace, may we grow spiritually every passing day. Overwhelmed!!! Your journal on VS is soul searching… Thanq once again. Very nice and informative. I like the references to Gita to supplement.